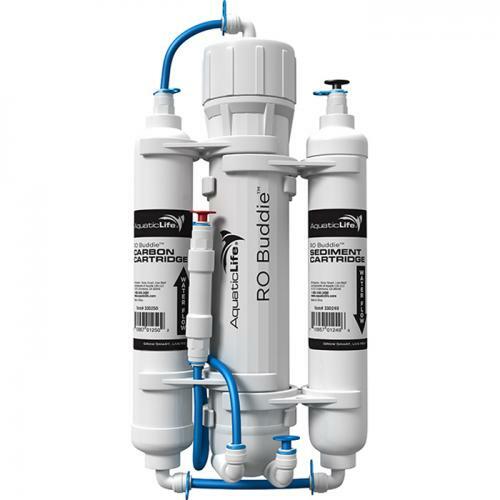 Brief Description: The Aquatic Life RO Buddie 50 GPD 3-Stage RO system features unbelievable affordability and functionality, all in a very compact design. Designed to provide a reliable source of economical filtered water for aquarium use, all systems use Thin-Film Composite (TFC) Membrane RO cartridges in conjunction with Carbon and Sediment cartridges to effectively and efficiently remove harmful substances such as heavy metal ions, dissolved solids (TDS), Chlorine and particulate matter from municipal tap water. Notify me when "AquaticLife RO Buddie [50 gpd]" is re-stocked. The RO Buddie 3-Stage systems can be easily upgraded to a 4-Stage RO/DI system by adding our De-ionization (DI) Color Changing Mixed Bed Resin Cartridge, Item AL330242, sold separately.